NES Battletoads (USA) "game end glitch" in 00:56.76 by MESHUGGAH & feos. 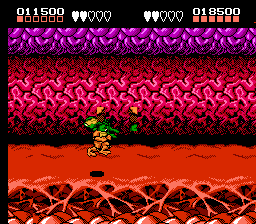 Battletoads (1991) is a futuristic beat 'em up game known for its extreme difficulty spread over 16 difficult levels. The mechanics in the game also change drastically from level to level, making the game one of the hardest and most varied for the NES. In this game, the second most diabolical evil genius in the universe, The Dark Queen, has kidnapped Princess Angelica and Pimple - a battletoad. Rash and Zitz must save them by traveling through the most insane multilevel set of plans ever designed. This includes falling down huge shafts, racing through obstacle courses at breakneck speeds, riding on snakes through a massive maze of spikes, passing through a killer ventilation system, navigating through a missile defense system, climbing a never ending revolving tower, and much much more. Along the way, the Battletoads must also face off against an evil army of robots, genetically engineered rodents, and The Dark Queen herself. In order to make the game a bit easier, its creators embedded some secret warp zones to skip a few early levels in their entirety. But that simply wasn't good enough for MESHUGGAH; he decided to travel directly to level 3, where he invents his own warp and skips right to the grand finale. He took a glitch found in this TAS and exploited it further, to the point the Dark Queen just gives up and returns Angelica and Pimple, going off to hatch an even more evil plan for next time. The glitch is done by breaking the game execution and sticking it right to the game ending. This run conquers the predecessor movie by 0.18 seconds by exploiting the fact that green toad is processed before the yellow one.